Our law office also handles elder law, family law, bankruptcy and personal injury cases. The reason so many people turn to our firm for representation is because we have a reputation for excellence. Our attorneys have been listed in The National Trial Lawyers: Top 100; they have earned the highest peer review rating possible of AV Preeminent* from Martindale-Hubbell; they hold an Avvo "Superb" rating; and they have been listed in the National Association of Distinguished Counsel's Nation's Top One Percent. Most importantly, we get results. 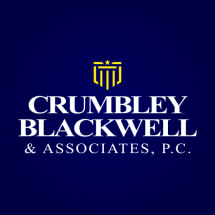 Our team at Crumbley-Blackwell & Associates, P.C., has guided thousands of people through the legal process and has 100+ years of combined experience. We strongly believe in providing the best possible service to people in and around Huntsville. That means we develop customized, strategic plans for our clients based on their circumstances. At our law office, no concern goes overlooked and no question goes unanswered. Crumbley-Blackwell & Associates, P.C., is a debt relief agency and helps people seek bankruptcy protection under the U.S. Bankruptcy Code. Have you or a loved one been injured in an accident? Contact our experienced team of personal injury attorneys today - we have decades of experience and offer free consultations for injury cases in North Alabama. We have an experienced team of Criminal Defense Lawyers with 100+ years of combined experience defending an array of criminal cases across Huntsville and North Alabama. Contact us today to schedule a free consultation. Our experienced DUI Lawyers have 100+ years of combined experience defending nearly 8,000 DUI cases across Huntsville, Athens, and North Alabama. Free DUI consultations available - contact us today to get started. Facing divorce? Put 100+ years of experience to work for your case. Our team of divorce and family law attorneys handle a wide variety of cases across Huntsville, Athens, and North Alabama - contact us today to schedule a consultation.